Are Christians Supposed To Be Radical According To The Bible? If you listen to the average news program it is not unusual to hear a commentator use the term radical to describe someone who is outside the mainstream when it comes to their beliefs or behaviors. Usually it is used to label someone as evil or dangerous based on their religious beliefs. In the case of Christianity, it is often used when describing believers who are more conservative of fundamentalist. 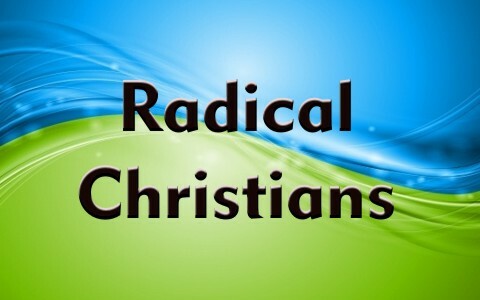 Based on how the word radical is used, are Christians supposed to be radical according to the Bible? What is the common definition of radical? The common definition of the word is (1): (Adjective) 1. (Especially of change or action) relating to or affecting the fundamental nature of something; far-reaching or thorough. 2. Advocating or based on thorough or complete political or social reform; representing or supporting an extreme section of a political party. (Noun) 1. A person who advocates thorough or complete political or social reform; a member of a political party or part of a party pursuing such aims. The important thing to realize is that this is how the word radical is defined today. However, today’s definition has changed over time from its original meaning as found in the Webster’s 1828 dictionary as follows (2): RAD’ICAL, adjective [Latin radicalis, from radix, root. See Race and Ray.] 1. Pertaining to the room or origin; original; fundamental; as a radical truth or error; a radical evil; a radical difference of opinions or systems. Comparing the two, we see that the use of the word radical today describes someone or something that is far-reaching or extreme from the fundamentals of what most people believe or do. Originally, it described someone or something that is true to the fundamentals of what most people believe or do. For example, from the beginning of this nation until the last century, teaching the Bible to schoolchildren was a fundamental part of education. Today, those who support teaching the Bible to schoolchildren are labeled as radical or extreme. The question is, what changed? What changed to make being radical a bad thing? The simple answer is Biblical illiteracy and disbelief. The word radical did not change, only the perspective of how the word is used and the people using it. Teaching the Bible in school today is considered radical because most people are Biblically illiterate and/or do not believe that giving children a Christ centered education is important. This is in direct contradiction to what the Bible and Jesus taught (Deuteronomy 6:4-9; Proverbs 22:6; Matthew 18:1-14; Galatians 4:1-2). To make matters worse, many who call themselves Christians openly call for the rejection of fundamental Bible doctrines because they might “offend” someone or they are offended by them. Sadly, the Bible has a lot to say about those who are offended by the Word of God. They do not love God according to Psalms 199:165, “Great peace have they which love thy law: and nothing shall offend them” (KJV). They cling to their personal beliefs and reject the teachings of Scripture (Mark 4:5-6, 16-17; John 6:60-66). From these verses and many others, we see that offending always involves anti-Christ and anti-Biblical teaching, sin, which elevates self at the expense of others well-being or causes adverse consequences, Biblically speaking, to others (Jeremiah 50:7). People do this because they do not have the mind of Christ nor want Him to be the Lord of their life so that they want to esteem others above themselves (Philippians 2:1-11; 1 Peter 4:1-3). What is the Biblical definition of radical? In this passage, Jesus stressed that offenses, anti-Biblical and anti-Christ beliefs and behaviors, would come as the time gets closer to the end times. However, He also warned those who are part of these anti-Biblical and anti-Christ beliefs and behaviors exactly the same way that Joshua warned the Israelites not to adopt the beliefs and behaviors of the heathens they would encounter when the lived in the Promised Land (Joshua 24:14-20). Unfortunately, both suffer that same end by not being radical as they were instructed. It is pretty clear that Jesus advocated being radical when it came to eliminating things in our life that lead us to sin and disbelief both in practice and in Spirit. How can we be Biblically radical? The first step is to have the mind of Christ. This comes by believing the gospel of salvation and actively seeking to have our minds changed by the power of the Holy Spirit through God’s Word (Roans 12:2; 1 Corinthians 2: 1 Corinthians 12:3b; Ephesians 1:9-23) . We actively seek this change of mind, or repentance, through studying God’s Word, prayer, worship, fellowship with others believers that seek the same, and serving in a local church that teaches the same. As our mind changes, we will notices that our beliefs and behaviors will become more radical in the right way as Jesus taught. Christians are supposed to be more radical according to the Bible. However, the definition of radical we should seek as believers should demonstrate our faithfulness to God and His Word in our beliefs and behaviors. Being radical according to the common definition of the word means that we differ from the beliefs and behaviors of the world. In light of the world’s perspective on being radical, being radical Biblically should appear to be radical according to the world. Something more that might interest you: What Sets Christianity Apart from Other Religions? Very good article. Thank you and God bless. Good article Dr., especially with the results of todays actions. I do not see how a person can allow themselves to kill someone over an ideal. That clearly goes against the teachings of Jesus Christ. I pray for those involved and those men that lost their lives over an ideal. I have read your article and I was wondering if we are meant to be radical in every way. Are we supposed to sit back and let our actions show Gods love? Or are we supposed to go everywhere, telling everyone we meet about him. Thank you for your comment. Not sure what to say but not being the author of this article, I would say that we must go into all the world to share the gospel to make disciples of all nations, even if it starts next door (Matt 28:18-20/Acts 1:8) because Jesus gave this “imperative command” to us all. hi Dillon, i could be really late but i thought i could leave this behind. we as Christians should do both. these two actions compliment each other. When we speak/ teach the word of God, that is like shooting a bullet in a battle field(Hebrews 4:12, Ephisians 6:17″and take the helmet of salvation, and the sword of the Spirit, which is the word of God”), it is giving a solution to ignorance which is the devils secret weapon, it is sewing the right seed of truth which helps strengthen faith(John 17:17, John 8:32, Romans 10:17). However unlike the common slogan “do as i say not as i do”, the only effective teaching is when you teach what you practice. infact i believe the right procedure is learn the word of God, put it to practice then you can teach others. That is the best way to handle even the nitty gritty challenges Christians face when walking in faith. you become A teacher not just a preacher! A disciple not just a follower!It is the only proof that you believe Christ’s leadership. the weight of your words is in your actions, it is an act of obedience! (James 1:22, John 14:23, John 14:15). SO YES WE ARE TO BE RADICAL IN BOTH WORDS AND ACTIONS!!!!!!!!!! !